Considering a upgrade? Here’s what you’ve been missing. First, check to see which version you’re running – Check our Software Updates guide if you don’t know. Then, read through the quick summaries of our recent software updates below. If you’re running an older version, you might want to check our complete Release History. Version 10.3 includes numerous improvements to Inventory Assemblies – the ability to generate assemblies for inventory requirements and directly from sales orders, and better support for multiple lot numbers for components. Acctivate now supports multiple Alternate Product IDs for each inventoried item, allowing better integrations with multiple web stores or sales channels. You can now apply credits to new sales invoices in Acctivate. Additional Level 2/3 data for Credit Card processing is now sent to Authorize.net and QuickBooks Merchant Service (QBMS). Process EDI now supports FTP to easily transfer files. The latest Crystal Reports run-time is included with a refreshed Report Preview window. A new, unified installer includes support for all international QuickBooks editions, which is especially helpful for multi-national organizations with both US and Canadian companies. The highlight of Version 10.2 was the new Sales Order Manager, a powerful way to manage a large volume of sales orders very quickly. You can learn more about the Sales Order Manager in our November 2016 webinar archive. You can now void (delete) a posted inventory transaction, sort the lookup window columns, and process credit cards and email messages in the Prepare Invoices wizard. WooCommerce 2.6+ is now a supported Web Store Integration. You can also watch our What’s New in Version 10.2 webinar. Version 10.1 had significant changes including a multi-field search/lookup, major improvements to notes and email, an automatic sync option for web stores, special order PO’s and much more. We made dramatic user interface improvements in version 10.0, including major changes to Sales and Purchase Orders. For example, the SO and PO “Header” and “Detail” tabs were combined and re-organized. It’s a lot easier to quickly enter orders now. All screens are now re-sizable and can be maximized too. We’re using a more modern look-and-feel that looks better on Windows 10. Version 10.0 includes a powerful Track & Trace feature for companies tracking lot numbers. It will look backwards and forwards, compiling a list of all transactions and customers receiving the product or any finished goods (assemblies) that contained the lot number as a component. This feature is critical for food and beverage companies, to ensure quick and accurate traceability reports for FDA and quality control. We’ve also merged the separate “EDI Manager” into the main Acctivate desktop, along with support for processing multiple EDI partners and transactions all at once. Authorize.net is now supported for processing customer credit cards, including the two-stage “Authorize and Capture” functionality (which is also available for QuickBooks Merchant Service). There are tons of other improvements. Please be sure to read through the Highlights and Details (linked below). 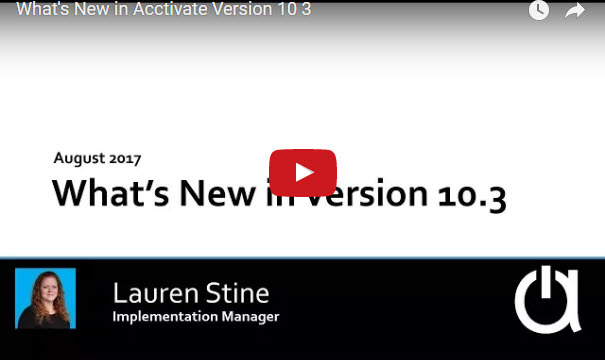 You can also watch our What’s New in Version 10.0 webinar. We introduced new integrations with best-in-breed cloud solutions, such as SmartVault Document Storage and Sharing, plus Avalara’s Sales Tax Service (AvaTax). These new integrations are sold separately as add-on modules. We also included some major improvements to the core Acctivate software. The ability to easily move, insert and delete lines on Sales Orders and Purchase Orders. We added a Sales Order Scheduling function to the Sales Order Mgmt tab of Business Alerts, which lets you re-schedule a huge number of sales orders quickly and accurately after receiving stock in from purchase orders. We made numerous improvements to lot/serial numbers and introduced great stability for companies managing a large number of lot/serial controlled items. Email settings are now available per-user. This is a great enhancement for companies using cloud email services such as Office 365 or Gmail. You can also watch our What’s New in Version 9.0 webinar.